Journalist, agricultural administrator, magazine editor and farmer. A member of the Council of the Society for Psychical Research for 55 years, chairman of its Image and Publicity Committee and secretary of its Survival Research Committee, he was principal investigator of the Scole Group of physical mediums, and author of the Scole Report, published in the Proceedings of the SPR (Vol 54 Pt 220) in 1999 with his co-investigators Professors Arthur Ellison and David Fontana. During this séance Montague Keen took a total of 13 photographs. However, photographs 3, 5, 7, 8, 9 and 11 do not add anything significant to the account and therefore have been omitted. The most significant photographs - 1, 2, 4, 6, 9, 10, 12 and 13 - are included. THIS IS an account of an unusual séance at which a variety of movements and touches, noises and voices were experienced in circumstances which appeared to preclude fraud. I give in considerable detail the precautions taken before and during the séance and conclude, despite reasonable familiarity with the past history of comparable demonstrations, that the effects were genuine. Photograph 1. General view of the medium’s chair and the "cabinet". Note the mains-fed tape recorder in left hand corner, tended by the medium’s wife. The sitting took place in the home of Denzil Fairbairn (DF) in Chalgrove, Oxfordshire on Saturday October 25th, 2003. My attendance was consequent on a personal introduction, supported by a good personal relationship of trust with Mr Fairbairn, following his important evidential contribution to the Scole Report (Keen et al, 1999). Together with my wife and myself, and DF, it was attended by Paul, the séance leader, David Thompson the medium, his wife Bianca and about ten or twelve others. The room was in a small block a few feet from DF’s bungalow, and was entered via an anteroom where all those attending were asked to leave behind loose jewellery, handbags, watches, pens, wallets, money: indeed anything which could be detached. For this purpose everyone was searched, although I was allowed to bring in a notebook and pen, which was left under the chair of my immediate neighbour, Paul, until he had an opportunity during the séance to ask whether permission would be granted by Spirit for me to use it during the séance (it was duly granted, but the pen could not easily be found in the darkness; so the idea was abandoned). I searched David Thompson and ascertained there was nothing in any trousers pocket or concealed on his singlet, over which he wore a cardigan which I searched separately before he replaced it. I also checked his trainer-type shoes to ascertain that the heels and soles were normal and unified. There was only one door into the séance room, which had no windows, was perfectly rectangular except for a recess at one end of the room (4'0"x 2'0"x7'0" high) which formed the back half of the cabinet, and was devoid of ornaments or recesses. It measured roughly 15'0"x9'6", and at one end carried a rectangular ceiling rail from which three floor-length black curtains were suspended by Velcro straps of curtaining material, so that the curtains could be opened and closed from both sides. This, along with the recess, constituted the cabinet. The room was seamlessly carpeted throughout. Apart from the entrance door from the anteroom, there were no detectable orifices beyond five small vents in the ceiling and three low-level vents along one wall, vented to the outside. Moulded plastic seats were placed around all the walls save the cabinet end. Two of the seats blocked the entrance door, and that occupied by my wife obstructed the door from being opened. Photograph 2. 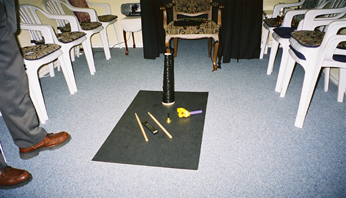 The principal objects used during the séance are seen on a board which, at the medium’s request, was moved nearer his chair to be more effectively used by the energies concentrated within the cabinet. The chair (owned by DF) in which the medium sat was an old-fashioned upholstered, heavy, wooden construction which I examined carefully, having regard to a claim by the magician Ian Rowland, when commenting on television on Thompson’s reputed feats, that this could be done by illusionists when the ends of the chair arms were not securely connected to the posts, thereby enabling the medium to raise his arms from the post and slip the cable ties off his arms: a suggestion I examine later. I could find no loose connections, and was unable to move the arms or see or feel anything abnormal underneath the chair. The chair was placed inside the open cabinet, and the medium was strapped into it by means of plastic tree ties. This was effected by Bianca under my close supervision. 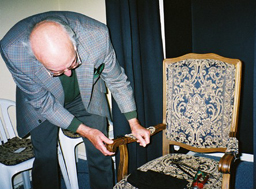 I was invited to examine the ties which were already permanently fixed to the legs and arms of the chair, both before and after the fixing. The straps were placed through these permanent fixings, and pulled tight, and then secured with thin plastic ties with the ends trimmed off, so that the only way to release the bond was to cut it. The straps were so tightly pulled that I was unable to intrude even a finger. Indeed, the medium subsequently was heard to complain that his wife had been so enthusiastic as to cause him discomfort. Bianca tied a black gag securely round the medium’s head through his open mouth, thereby preventing recognisable speech. I examined the gag and the knot behind the head. Finally the several buttons on the front of medium’s cardigan were tied into the buttonholes with thin black strips of plastic. These are one-way (self-locking) cable ties, incapable of being untied. They have to be cut before a button can be released. Photograph 4. The author examining the plastic fixings on the chair. Note the absence of any cut on his right thumb. On the floor a few feet in front of the medium there was a black coated piece of board, about 3’6" by 2’. After I had checked underneath (prompted by Mr. Fairbairn) to satisfy myself that nothing was concealed below it, the following items were placed on it: a cardboard trumpet, the end of which was coated with luminous paint; a mouth organ; a rattle, and two drum sticks, all of which were to play a part in the séance. In addition there was a pair of pliers which were employed by Bianca to cut the ties to release her husband after the sitting, and two wooden rings which were brought into the room from the anteroom at the medium’s request by DF after my wife had taken a number of photographs. A microphone (Optimus 33-3013) was suspended from the wall near the door, the other end being connected to a Sony personal tape recorder located on a small table next to DF. The machine was switched on by him and the cassette tape turned over after it had automatically switched off on reaching the end of one side. Copies of the tape recording were freely available to any participant requesting it by sending a blank tape to DF. The only other equipment was a small flexible table lamp with a red bulb and fixed shade. It was placed on a small table in the corner on the medium’s left, outside the curtain, together with a glass of water. In the opposite corner was a large a tape recorder playing music. The light was controlled by Paul who sat alongside me, while the music player was the responsibility of Bianca, who had to make frequent changes in the music played and the volume requested, at the behest of spirit communicators. Both Paul’s hands held my right hand throughout the séance, save for about five minutes when they were needed to switch on and manoeuvre the light during the brief period when ectoplasmic extrusions were being shown. Photograph 6. The medium photographed shortly after the end of the séance, his eyes guarded from the camera flash, awaiting release by his wife Bianca, seen alongside the séance leader, Paul. The tightness of the feet bindings are apparent. Before the séance, when all participants were seated on cushioned chairs against the three walls, Paul enjoined everyone to remain still, not to grasp at anything unless permission was sought and granted. He explained the dangers to which the medium was exposed should anyone make an unauthorised grab at any ectoplasmic extension, and emphasised the importance of keeping our arms still: advice echoed and amplified by communicators in response to questions later. The lights were then dimmed to disappearance. The light switch knob was removed from the wall-mounted dimmer switch, and the remainder of the box was taped over by DF. The séance began with a short prayer offered by one of the sitters. This was followed not by normally rousing music but, rather to my surprise, by Pachelbel’s canon, to which we were invited to sing along, and then, no less surprisingly, by the distinctly menacing dance of the courtiers from Prokofiev’s Romeo and Juliet. Thereafter more popular music was played, but frequently altered in volume at the behest of one or other communicator. At the end of the sitting, following the withdrawal of the final communicator, DF stripped the sealer tape from the light switch and restored the dimmer switch knob to enable the light to be slowly turned up. It revealed David Thompson still tied to his chair, and gagged, in the middle of the room, some seven or eight feet from its original position inside the cabinet. It had been moved over the top of the black board and its several instruments. When the medium had recovered sufficiently to face the light, and the gag had been removed and retied to shield his eyes from the flashes, my wife took a number of post-sitting photographs. These included one showing the cardigan reversed. Having checked that the ties were still in place, I watched as Bianca used the pliers to cut each of the ties fixing the buttons to the buttonholes, and examined the arm and leg bindings as she cut the ties before the straps could be unfastened. 1. The translocation to a different part of the room of the medium bound in his chair. Photograph 9. Bianca, holding the end of the black blindfold (formerly gag) before severing the ties on David Thompson’s reversed cardigan. 2. The reversal of the medium’s cardigan, with the plastic ties still unbroken. (see photograph 9). 4. The trumpet, the luminous large end of which was seen to be performing a variety of patterns and aerobic adornments in the air, was operated at great speed and with considerable precision, and was pressed quite hard against my chest at one stage. 5. My head was tapped sharply several times, apparently by the luminous end of the trumpet during the aerial demonstrations. Photograph 12. The author’s tie, unknotted and pulled from his shirt, was found on the carpet between his chair and that of his wife. 6. I was vigorously slapped on both knees as an introduction to the first supposedly materialised entity. 9. While holding my wife’s right hand with my left, leaving my index finger protruding, we were both touched by a warm, soft and seemingly human hand for about fifteen seconds. 10. There was tap dancing of an apparently expert kind, as well as extremely fast drumming on the ceiling during the Irish jig music. Photograph 13. Two wooden rings were slipped over the hand of Alan. They were removed with some difficulty. Note the cut which has now appeared on the author’s right thumb, which was not apparent in a photograph taken before the séance. (see photograph 4). 12. There were very clear, loud and distinctive series of four voices we heard, all of which answered questions intelligently. The evening was notable for the clarity and fluency of the two principal communicators, who introduced themselves as William Charles Cadwell, (died 1897) and Sir William Crookes (OM, FRS) both of whom invited and answered questions. Two other voices familiar to the regular participants also came through: a cockney youth named Timothy Booth, and Louis Armstrong. Both had very distinctive features and claimed to have materialised. Timothy was responsible for the widespread reports of touches and boisterous noises, as well as the delicate management of the ectoplasm and the ordering of the correct degree of red light to enable us to see the medium but not harm him. I produce below an edited account of the entire séance for the record. Despite its necessary length, each virtually verbatim account, based on a tape recording, highlights interesting aspects of mediumship phenomena and ontological issues. I have omitted such phrases as "my dear friends," "of course" and suchlike adornments. Cadwell, who came through very soon after the introductory music stopped, and who talked in a clear, elderly and precise voice, not dissimilar to that of Crookes (apart from the impediment Cadwell had in rolling his R's) who spoke much later, described himself as a guide and mentor to "young David here" and expressed an interest in me as "some would say, an understanding scientist" (I expressed modest gratification). They (his spirit associates) would "endeavour to prove to you that life exists beyond death". He urged us all to follow Paul’s guidelines for the protection of the medium and of the circle itself. He invited questions. When Paul sought permission for me to use my notepad, he gave approval provided I held the notebook neatly against my torso; then he withdrew into the cabinet for a few moments, accompanied by a whooshing sound, and then proceeded to invite questions. I asked how the voice was produced, and how far it used the medium’s larynx, or how far it was direct voice. "Well, I could describe it to you now that I myself am partly materialised. The ectoplasm is exuded from the medium’s body by various orifices and is moulded around the young man’s voice box to create a larynx effect, but of course I myself am speaking to you with my own voice: placing myself within the ectoplasm exuded from the medium’s body by means of coating the etheric body of the ectoplasm, you understand?" [Yes] "And I am then able to speak. There is at some point during the séance when the materialisation of form is not taking place and it is merely that of independent direct voice. You understand?" [Yes] "But I myself partly materialise." [Thank you very much]. Q: Do you feel you have moved into the room, or are you still at your point of departure? A: I hope that I am in the room; otherwise I’m in the wrong place [laughter]. Q: You feel that you have moved? MK: Well, perhaps I could ask again. You say you feel solid, but you are in fact a creation of your own mind: is that not the case? A: If I could describe to you this: due to the vibration of young David that is emanating from his physical body, I am able to interpenetrate that of the earth’s vibration by means of my etheric body vibration changes. I am then able to coat myself into a physical ectoplasmic form; then I am able to be here within the earth environment; but when the energy depletes it is much more difficult for materialisation and communication to take place, so the need is for the energy to be produced, so often by yourselves, to help the energy of the young man within the chair: to substantiate the energy levels and keep them at such a level that I myself and others are able to commune. You understand? "Substantiate" is used in a strictly accurate, but today unaccustomed, sense here. A: As it is for me to describe absolutely what is taking place: it is quite a process that is more than what I have explained, of course: you understand. The voice then urged us to hold hands for a moment. A: "I shall show you something. What is your name, sir? A: Good evening (pause) [I was then slapped vigorously on my right knee]. MK: I was heartily slapped on my ... oh again [on my left knee] with a very solid feeling. Thank you! Q: Why, when we held hands there, did that make it easier for you to demonstrate that? A: It helps the energy to be built up to greater levels, but also it is for the safety of the medium and the ectoplasmic structure. Quite often when people are touched they feel the need to touch back or flee from whatever: so it may be safety as well, you understand. Q: You mentioned the energy being heightened by holding hands. Is that what would have possibly enabled Mr Webber to work without a cabinet during his mediumship, because I think they held hands throughout the whole séance. Jack Webber, who died aged 32 in 1940, was a prominent physical medium who was befriended by the celebrated healer Harry Edwards. He published many photographed showing Webber, without a cabinet, and with apparent ectoplasmic emissions from and around him. A: Yes, that is correct. Q: So it is possible to work without a cabinet ...? Q: So that, therefore, it would be beneficial for those in development to sit within a cabinet rather than ...? A: Yes, of course, in the early stages. The cabinet is used to allow us to keep the energy close to the medium, but also for the ectoplasm to be manipulated far more easily for materialisation to take place. Q: Is it going to be possible for the medium here to actually produce physical phenomena in some sort of light? A: Recently photographs of ectoplasm have been taken in red light. We don’t wish to disappoint Mr Fairbairn, but we do understand that may there is a little concern with him (?) regarding the use of other venues in the area, so Denzil can you hear me? [I can] We shall endeavour this evening to produce ectoplasm that can be seen in red light. This will be the first time it has been done outside the environment where the home circle is normally conducted. So it will be a first: it will be your sanctuary where we wish to do this. This was a semi-public séance as distinct from one where regular sitters meet privately in a domestic or home circle. DF: An honour and a privilege, William; thank you. MK: May I ask another question: this anticipates some of the inevitable queries by my more sceptical colleagues who are always insistent that, despite the elaborate precautions taken to avoid any form of deception, they would still like to have infra-red photography through a video: we have never quite understood what the technical objections are to this. Would you be prepared to elaborate? A: I understand: any form of electrical equipment that is used for infra-red photographic images of any sort does exude a type of ray, I believe the right word is, but of what consistency I do not know, but this type of ray that is exuded from the photographical equipment has a burning sensation upon the ectoplasm. It is a little like placing the hand in sulphuric acid. But as mediumship progresses in time there will be no need for infra-red photography because all will be seen in spirit-induced light or that of red light if possible so that, as sceptical as your colleagues may be, they cannot be sceptical when the medium is firmly strapped in the chair and a materialised form is seen to be standing in the room. MK: If I may say so, with great respect, you’d be surprised how far scepticism is sometimes taken. A: Of course, there will always be those whom you cannot prove to them no matter what you do. Within your field you will always have those who believe or wish to believe, and those who do not. This is a fact of life. MK: Unfortunately this is too true. A: Convey to her this: to pass into the spirit vibration is a glorious reunion of souls that have passed before. It is nothing for your sister to be frightened of: it is a changing of vibrations - that from the earth to those of the spirit vibrations. Quite often people are retarded because of their religious belief that they are going to some place of eternal sleep but, of course, in the initial stages of entering that of the spirit dimension they themselves might feel the necessity to sleep, and quite often these people wake up and wonder what they are doing when they have no physical body to sustain them any more; and when this occurs it is quite often that clergyman of their chosen religion will go visit them and speak to them and explain that there was certainly [...?] eternal sleep. Now if I remember right Mr Leslie Flint, who was a direct voice medium, there was a tape produced by Dr Cosmo Lang who was the Archbishop of Canterbury, and who returned and said, ‘Of course life goes on, and I was wrong in my assumptions whilst I was here upon the physical plane’. My great friend Dr Theobald Slawinsky who is a cardio-vascular surgeon and works with young David in the state of trance for the purpose of healing and psychic surgery, would be more than happy to visit your dear sister, and if he is able to help, of course he will [Thank you very much]. Be assured there is nothing to fear. Q: There some schools of thought who say that the earth plane is a plane of individualisation. I was trying to sort out in my mind whether this individuality once established on the earth plane: does it remain in the person’s consciousness once they are in spirit? Music: all join in singing "Jerusalem" after a squeaky voice was heard. This was followed by an Irish jig, accompanied by clapping sticks in strict time to the music; then a more vigorous jig to which something appeared to be dancing and clapping materialised hands. "Banging on the ceiling" said my wife, amid much noise. The trumpet’s luminous tip was flashing around the room and periodically touching sitters. When the music ceased, amid cries of "well done", another less energetic tune followed, and a small voice said "Turn it off", at which point Bianca switched the music off, and Tim introduced himself. After some light-hearted badinage with DF, Tim explained in a high pitched, artificially baby-like voice that it was his job to make the ectoplasm come out. He asked whether he should materialise, which he was encouraged to do. Then he said he needed a bit more ectoplasm, and urged us to hold on. There was a whooshing sound of a strangulated type, and a sudden scream of childish laughter. DF said he had missed the board [with his jump from the cabinet]. Tim complained that it had been put a long way away [from the medium]. Paul commented, "Just testing you". DF: mind you don't twist your ankle! Tim: No need to test me, Buzzy Boy. It is not unknown for ostensible children to perform quite adult functions in séances. Mrs Osborne Leonard’s principal control was Feda, whose childish mispronunciation and temperament was allied to considerable intelligence, as here. DF: Timothy, when you had the trumpet up, it would seem that separate from that - I don’t know whether anyone else noticed - but I did see quite a few sort of flashes. Is that something you were experimenting with? DF: It was very, very quick and subtle, rather like a glow of energy rather than a pinpoint of light, but it was definitely separate from the trumpet. Tim: D’you know what we’re going to do tonight? You’ve got choices. If you want to see ectoplasm in red light we won’t be able to bring in any loved ones. We haven’t quite mastered doing both. [The consensus of opinion was sought by Paul. Tim assured us that he could always come again and bring through loved ones. Red light had it.] Tim commented: "We can do most things but we can’t work miracles" - another cackle. He asked whether anyone was frightened. Was my companion my wife? I confirmed this, and said she was nervous only when he laughed. He urged her not to be frightened and assured her she would not be hurt - may be a little bit [more laughter]. He then asked everyone to listen because he had fully materialised. There were sounds of something walking about; Veronica let out a short scream as she was touched on the knee. Then both her right and my left hand, holding one another, were fondled for several seconds by what seemed to be a small hand, quite soft and warm. Paul, on my left, said that both his hands were holding my right hand, and the man on Veronica’s left confirmed that he had been holding her left hand throughout, all the more tightly because she was clearly nervous. Tim asked whether we had heard his footsteps: "You see, I materialised partly, then". When he complained that we were a very quiet lot tonight, I commented that we were awestruck, and Tim remarked that oars were used for boats [cackle]. He appeared to require more ectoplasm and said we could release hands for the moment. DF said he could see a fairly bright light in front of him, but it seemed to have gone. It stayed in the same place even when he moved his head. Tim explained that they were creating an energy field around the room. Tim then addressed "Mrs Monty" and asked whether she had a camera - a new-fangled one. Veronica said she had, and Tim confirmed that, at the end of the sitting but before the medium was cut out of the chair, she could take a couple of photographs, if that was all right with Paul. Paul sought further guidance and suggested it would be better if the pictures were taken when the medium had been released and had been given some water, but Tim said it ought to be done when he was still bound. The medium would say when he was awake. Photograph 10. A present for Bianca came in the form of an apported silver cat mounted on a tiepin, and found on the floor after the séance. Tim then announced that he would bring an apport for Bianca. (see photograph 10). She promised she would wear it all the time. Veronica asked where he got the apport from. He said he would have to seek permission to tell her. There was a short pause, then he announced that he had been given permission. He said there was a stall half way down the Portobello Road that sold curios: he thought it was called Jan or Jane's Curios - or something like that. "We borrowed it off of her" [laughter]. "We asked her mum in the spirit world if she would mind and she said she won’t even miss it - but she did, you know: she was looking for it to try and find it!" [cackle] "And just to make it more interesting, when we switch the red light on, we’ll try and materialise it: we’ll apport it out of his mouth, shall we?" [Chorus of assent]. "We’ll materialise it in the ectoplasm and try bringing it out of his mouth." When DF pointed out that David had a gag in his mouth, and implied that this might make things difficult, Tim said: "You’d be surprised. He’s got a big mouth" [laughter and cackle]. He said they might need music to enable them to do what they had to do. He would let us know when he was ready. A popular street market in West London. After a brief interrogation about the curtains and lights, and whether the music should be played throughout, Tim promised to make a bang when they were ready. He didn’t want the red light too low or too high because they (the spirits) had never attempted this before... They might see the medium’s face contorted a little. He was asked whether he could knock three times to ensure that we knew when he was ready, to which he responded, amid laughter by singing Knock three Times on the Ceiling if you Want me. Music was re-started. We joined in singing An Alien in New York. Paul then asked for the music to stop and everyone to remain absolutely quiet. I was asked to turn on the wall switch governing the red lamp. There followed much manoeuvring while the curtain on my side was opened and the light, pointing downwards to avoid shining in the medium’s face, was adjusted. Bianca checked to ensure everyone could then see the medium. We then saw a white substance stretching from the medium’s face and across his chest to his lap. After about half a minute Tim asked for the light to be turned off at the main. The music resumed. Tim explained that the music and singing were needed to generate the energy, a lot of which was needed for this sort of demonstration. He asked DF when was the last time he had seen ectoplasm. DF replied that it was about three years ago in a sitting with Stewart Alexander. Since then there had been some 300 people attending his séances. Addressing me as "Uncle Monty" Tim asked for my reactions. I wondered what had become of the ectoplasm. Tim said it had been dematerialised: it was dangerous when the ectoplasm was out of the medium. He had kept a little bit for himself to enable him to talk to us. This was the first time they had brought through an apport via the ectoplasm with the red light on: it was dangerous. Veronica described a light she saw in front of her. DF said it was the same as the light he saw. Tim asked me whether my wife usually saw such things. I said she did, but I did not. Tim observed amid laughter that if "your missus sees things it’s got to be true" - followed by another cackle. He called for music. It was switched on. I did not see the apport being produced, but it was on the floor near Bianca when the séance ended. After one song, the music played a Louis Armstrong song, Wonderful World. Armstrong’s voice was heard on the music, and then a voice apparently identical to Armstrong’s accompanied it. It was quite clear. This was followed by the voice introducing himself thus: "How are all you fine people here this evening? May I introduce myself? My name is Louis Armstrong" [expressions of welcome], "known by many as Satchmo. I’ve got to say this is very difficult speaking through this here voice box" [murmurs of sympathy and encouragement]. Bianca sought permission to pose a question, "Yes you can ask me a question if you wish, my dear." She said she had lost a tape with Satchmo singing with a lady, and she could not find it. "Well my dear you’ve got the record at home". Bianca expressed gratification. "So you didn’t have to look that far did you?" (pause) "I’m just going to materialise." There followed a whooshing noise followed by the sound of a minor collision. I commented that he’d tripped over something. "No I haven’t my frien’. I’m just showing you I’ve materialised." There followed several knocks and bangs, and it became clear it was some sort of soft shoe shuffle. "There you are my friends, and I bid you good night". The voice was loud, clear and highly idiosyncratic, immediately recognisable as Satchmo’s uniquely guttural pronunciation. After a pause, we heard some heavy breathing sounds, and a very croaky voice, which shortly became firmer, addressed us: We welcomed him. We were asked to keep talking to help the vibrations. Paul greeted him, and the voice asked everyone to sit still. "I wish to fully materialise..." He introduced himself as Sir William Crookes. "Some of you may know me from my scientific research, but some of you by means of my communication and friendship with the physical medium Florence Cook. At no time was there any doubt in my mind of any fraud or of Miss Cook. [Comment from DF: There are quite a few photographs showing Florence and Katie (King) separately.] "There are two reasons why I came to this gathering this evening. One was purely to make my presence felt here and to commune with people of like minds. One was also because of my interest in this young man’s mediumship. As you have seen this evening, ectoplasm was exuded from this young man in red light and seen, and as you know I myself witnessed full materialisation in light, that of the materialised form of Katie King. Are you all familiar with this [general assent]? I shall endeavour to move further into the room. Now I am sure there are those amongst you who may have questions of me. Please feel free to ask and I shall endeavour to answer." I asked whether those guilty of unfair opposition and criticism during his lifetime had now recanted in the afterlife. He replied: "I would not say they have recanted. I would say their minds have been firmly changed." He asked my name, and I told him. "Ah, so you’re Keen are you? I have heard words of you, I can tell you, dear boy. I understand you are going to endeavour to continue some of the work that I started". [We are] "Well carry on the good work, dear boy". I commented: "Your work was an inspiration to us and many others". He replied: "I was not swayed, dear friend, by any means." I then quoted his words "I did not say that it was possible; I simply said that it happened." At this point I felt my tie being unknotted. I commented on this, saying that the hands unknotting it were firm. "My tie is now being pulled out and I think undone by firm hands. Thank you. Both my hands are being held and - ah! My tie is being taken off! I hope it won’t dematerialise". "As you can see, my friend, anything is possible", the voice resumed. "Let me explain something in regard to external energies being brought into the séance room. Some of you may know I myself was a party to developing vacuum tubes which were part of X-ray tubes, you understand. Do you know of this Keen?" [I do, sir] "Well you will know that X-ray is something which exudes energy, does it not, which can sometimes be detrimental to that of the patient in large degrees. 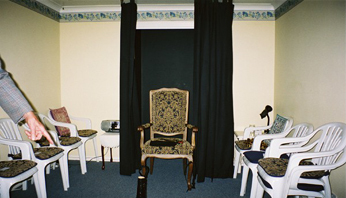 Well, within the séance room the energy is in heightened state, and bringing into the séance room any form of electricity other than that that is compensated for, which sometimes proves to be quite difficult to work with, can have a disastrous effect on the mediumship of the individual within the chair. When I witnessed the materialisation of Katie King, that was the most thought-provoking change in my life. It was at that time that the reality of life after death really touched my soul. Then there was no going back. Then I had to bring to the world the truth of the continuity of life. Now I would say this to you: put away your electrical equipment of infra-red status for this young man and other physical mediums, manifestations will be seen again in that sort of light produced either by the spirit vibrations or by that of your own means, if we allow it in the séance room. That is all I have to say." Q: When working with the medium you worked with, did you witness her materialise from nothing, or from scratch basically to full form, or did you just witness her coming out of the cabinet? A: At one time I was privileged to see ectoplasm exuding from the medium’s body by means of the mouth and solar plexus, and from this even what seemed to be ectoplasm on the floor in front of the medium the materialised form began to arise until there was a full form materialisation before my very eyes. Q: How long did the process take? A: About five minutes from nothing to full materialisation. Q: Do you have a laboratory of some sort now? A: There is not necessarily a need for a laboratory where I am in the spirit dimension, but I do quite often visit chemists and such that work in laboratory environments on this earth vibration to learn new skills. I must go now. It has been a pleasurable experience to be able to speak to you good people. Something fell or was pushed between my left arm and Veronica’s right. Veronica also said she felt it. Music followed, accompanied by bangs, clashes, rattle-swinging, drumsticks etc without relevance to the music, and amid a good deal of reports of touches, interspersed with the occasional mild scream from Veronica. Almost everyone appeared to report touches or minor knocks. Immediately the music stopped, Alan reported that two rings were over his wrists. Tim asked for the music to be changed: a nice uplifting one - the energy was becoming a bit thin. Bianca expressed renewed gratitude for her apport. There followed a reprise of I’m an Englishman and a loud farewell from Tim. Then another song, unaccompanied this time. The music faded out, and the séance ended as the red light was slowly restored amid some heavy breathing. The sound of sealing tape being ripped off the light switch was accompanied by instructions from Paul to remain completely quiet while Veronica retrieved her camera from the anteroom. 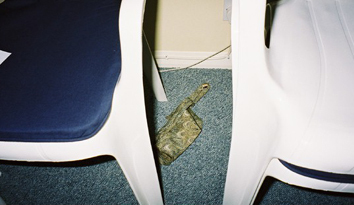 The medium’s eyes were protected from the flashlight for the four or five pictures taken by Veronica, showing the medium strapped to his chair in the centre of the room. When the medium’s blindfold, which had been used as a gag was removed Paul drew attention to the remnants of ectoplasm still on the material. It is almost an article of faith among many psychical researchers that unless physical phenomena are capable of being clearly witnessed, or alternatively that infra-red video recording is available, no persuasive evidence of anything paranormal is possible. Although the spirit portrayed as Sir William Crookes explained why an infra-red video camera might be damaging to the medium at his present stage of development, the general rule of evidentiality may be broken if the other security measures justify an unambiguous assertion that deception on the part of the medium was impossible. The nature of the ties would have prevented the medium, no matter how strong or agile, from escaping his bonds without first managing to cut the ties. Even had he been able to do so, he could not have regained his seat and retied the knots unaided, employing a new set of uncut ties, unless he had been helped by someone able to work deftly, accurately and swiftly in pitch dark. No-one in the séance room could have attempted that without ready detection. Moreover my careful examination of the chair showed no sign of any movable join. Finally, the reversal of the medium’s cardigan while he was still bonded to his seat defies normal explanation. The precautions here were superior even to those employed by Schrenck Notzing on Eva C, who was sewn into a single garment, or on the physical medium Jack Webber, where less sophisticated tying methods, and materials, were used. During the brief time when the red light was switched on, we could all see, the medium draped with a white cloth-like foam substance, presumably ectoplasm, albeit not with great clarity in some cases. It corresponded in appearance with many of the photographs showing ectoplasmic emissions from past mediums; but the facilities for overt examination of it contrasted rather strikingly with these available to Harry Edwards in his supervision of Webber, who was extensively photographed by flashlight in various stages of ectoplasmic production, apparently without injury to the medium (Edwards, 1961). For this apparent anomaly I was given two reasons: Webber may well have been more strongly developed as a medium; the photographs were all taken with the consent of the spirit guardians, who had an opportunity to withdraw the vulnerable animation spirit from the ectoplasm before photographs were taken. There are also the very large number of flashlight photographs taken by or on behalf of Schrenck Notzing, and reproduced, albeit poorly, in The Phenomena of Materialization (Schrenck Notzing, 1923). The voices themselves could not have come from the gagged medium. The only other "regulars" on whom suspicion might rest were Bianca, his wife, Paul the leader who was seated next to me, and whose voice and location would have clearly identified him, and DF, the host, who was seated at the opposite end of the room from the medium. Any of these possibilities would have easily and immediately detectable by those present, as well as likely to be defeated by listening to the tape recording. While the communications did not contain anything which could be regarded as convincingly evidential, the information was consistent with what is known of Crookes, and the answers to all questions were unhesitating, coherent and sensible. The remaining physical phenomena did not appear to me to be susceptible to any normal explanation, considering that hand-holding (despite Eusapia Palladino’s purported skill in hand-substitution) effectively ruled out those closely associated with the medium: Bianca and Paul, as well as DF. Although much of what occurred was expected, save for the use (for the first time, we were told, in a non-domestic circle setting) of red light to enable ectoplasmic extrusion to be seen, and in accordance with reports which had appeared in the Spiritualist press (e.g. Alexander, 2003, Eccles, 2002, Fairbairn, 2002, Fairbairn, 2003 Hunt, 2000 (and Pearman, 2002), I have listed above some other remarkable physical phenomena which have little or no dependence on the frailties of memory or the defects of observation. Alexander, S. 2003. 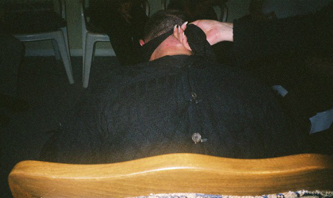 A David Thompson séance reported by renowned physical medium Stewart Alexander. Psychic News, January 4. Eccles. V. 2002. David Thompson gives a séance at Tumbetin in Australia. Psychic News, Sept 21. Edwards, H. 1961. The Mediumship of Jack Webber, The Healer Publishing Co.
Hunt, H. and C. 2001. 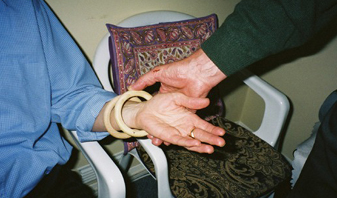 Report on a physical séance held at Crawley. Psychic News. October 6. Keen, M. Fontana D and Ellison A 1999, The Scole Report, Proceedings of the Society for Psychical Research, Vol.58, pt 220. Pearman, R. 2002. A Star-studied Evening with Physical Medium David Thompson, Psychic News, Dec 21-28. Schrenck-Notzing, B. von , 1923. The Phenomena of Materialisation, tr. Fournier d’Albe 1st English Edition, Kegan Paul, Trubner. This article is copyright Veronica Keen 2004. It is published on this website with permission.